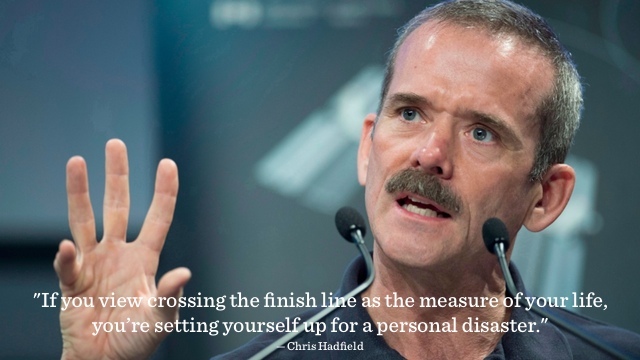 A fantastic interview with Canadian astronaut Chris Hadfield on life, the universe and what’s really out there. Here’s an excerpt that really struck me and hits home on one of our key themes: living a meaningful life. If you view crossing the finish line as the measure of your life, you’re setting yourself up for a personal disaster. There are very very very few people who win gold at the Olympics. And if you say, ‘if I don’t win gold then I’m a failure or I’ve let somebody down or something,’ .. What if you win a silver? What if you win a bronze? What if you come fourth? What if your binding comes apart? … What if all of those millions of things that happen in life happen. … Only a few people that go there are going to win gold. And it’s the same in some degree I think in commanding a spaceship or doing a spacewalk it is a very rare, singular moment-in-time event in the continuum of life. And you need to honour the highs and the peaks in the moments — you need to prepare your life for them — but recognize the fact that the preparation for those moments is your life and, in fact, that’s the richness of your life. … The challenge that we set for each other, and the way that we shape ourselves to rise to that challenge, is life. We can add this bit of wisdom to the advice of Yvon Chouinard and Viktor Frankl. This also relates to why you should adopt systems over goals. Still curious? Learn more: An Astronaut’s Guide to Life on Earth: What Going to Space Taught Me About Ingenuity, Determination, and Being Prepared for Anything.